the online newsletter is often overlooked by many bloggers. Bloggers focus on creating quality content which is good, drive traffic and forget to convert readers into subscribers. If you’re doing the same, it’s time you need to consider having an online newsletter for your blog. The difference between a successful blog and a blog that is not is how you get readers to read your content and increase your readership regularly. Well, online newsletter subscription is one way of making sure your readers get updated regularly. What strategy you use will depend on what you want. This is the automated way of sending the latest blog post to your subscribers. There is free and paid option. For the free option, my best is Feedburner while for a serious blogger or website owner like you, should consider using getresponse. 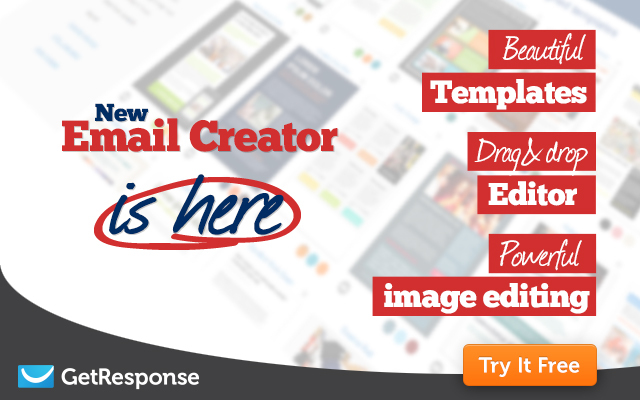 Getresponse uses email marketing software which gives you the ability to schedule content on autopilot (signup and try it free for 30 days). Whichever method you use, you’ll be able to convert your RSS to a newsletter. Isn’t RSS the new way forward? What about Social Networking – isn’t that more effective than email newsletters? Aren’t Newsletters very one way and not very conversational? Isn’t building a ‘list’ as a way of doing online marketing a thing of the past? Doesn’t the Blog replace the online newsletter? All are ways to build and get engagement with your list. What are the reasons why you should use newsletter? Well here are the 8 benefits of having an online newsletter. You cannot rely only on people who visit regularly to read your content. Even such do miss out some of your updates due to one thing or the other. This makes it easier to update people about the latest blog post, contest, giveaway or even notify them about your future content. There are chances that new readers that found your content exciting and really liked it, might forget your blog name or to even bookmark your blog. With a subscription form, a new reader will subscribe to your update. A future update will make the new blog visitor regular reader. This is good as you may in future promote your product/service and become clients. The key here is to provide an online email newsletter that is valuable to your recipients when needed. In order to maintain any relationship it must be mutually beneficial and proof of your expertise on the subject. Avoid using sales pitch all the time else your subscriber will term you as greedy. If you’re only reaching out in times of need or sharing info your recipients don’t care about, you’ll likely end up in the “Trash” folder. Do you have an upcoming event or product launch, email newsletters can be a great way to spread the word about what’s coming up. Many may shy away from visiting your blog, but telling them about an upcoming event or product launch, will make your subscribers jump into action especially if you have already built a relationship and have authority in the niche. online Email newsletter is very easy to share. Like social media, it’s easy to tell your readers about the new update, upcoming events, contest, product launch and so on. Much easier to create and distribute than the traditional direct mail. You don’t have to go through the stress of printing or postage. An email newsletter is faster and you can include other valuable links to other content. Anyone that subscribe you’ll know that the subscriber has an interest in your blog niche and will continue to read your blog. Having a targeted traffic will make your blog active always. When you have targeted traffic and blog readership increasing, you can tend to make money from affiliate marketing, your product, courses, sponsored post and advertisement. Would you like to write for sandalili? Or sign up for our RSS?